Jeff Vinnick/Getty ImagesDonald Trump Jr.
CNN issued a major correction to a bombshell Trump-Russia story. A Washington Post story may have nullified the central bombshell of an earlier CNN report. CBS News had confirmed CNN’s initial report but also later issued a correction. CNN on Friday issued a correction of a story detailing an email sent to top Trump world officials about hacked documents from WikiLeaks. 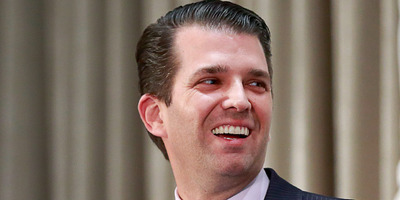 Earlier Friday, CNN published a story saying that then-Republican presidential nominee Donald Trump, his son Donald Trump Jr., and other Trump Organisation staffers received a September 4, 2016, email. The email offered a decryption key and web address for a cache of hacked documents WikiLeaks possessed. But the email was actually sent on September 14, CNN said. “CNN’s initial reporting of the date on an email sent to members of the Trump campaign about WikiLeaks documents, which was confirmed by two sources close to CNN, was incorrect,” CNN said in a statement. CNN’s original report said the email was sent more than a month before WikiLeaks began releasing Clinton campaign chairman John Podesta’s hacked emails, less than three weeks before WikiLeaks itself sent Trump Jr. private messages on Twitter, and – importantly – 10 days prior to the release of hacked emails from former Secretary of State Colin Powell and additional emails from the Democratic National Committee. Hours later, The Washington Post published a story that first brought out the discrepancy in the timeline. The date change makes a world of difference. By September 14, Powell’s emails had already been published on the website DCLeaks.com, and the additional DNC emails were made public by WikiLeaks. Erickson wrote that Powell’s and the DNC’s hacked emails could be accessed. The email was described to CNN by “multiple sources” and “verified by Trump Jr.’s attorney,” the publication had written. CBS News separately confirmed the email Friday, originally reporting as CNN did that the message was sent on September 4. Soon after, CBS also issued a correction and said the date was actually September 14. “If the Washington Post is correct, then the whole CNN story was fundamentally wrong and misleading,” tweeted Intercept journalist Glenn Greenwald.